Macaws For Sale - Where To Find The Best Deal? Macaws are amazing animals. No matter the breed they all seem to be painted with the brush of a highly skilled artist. Bright hues of blue, yellow, green, and gold wrap around each other to form the final product. Besides their beauty, they are fairly intelligent creatures, and the macaw’s large size seems to make them all the more entertaining when they play. When looking for macaws for sale you’ll find yourself picking through some of the highest prices paid for an average exotic bird. Full grown macaws sell for thousands depending on geographical location. Then you will spend close to that on their cage and other supplies. Finding the best deal, though, is easier than most would imagine, you just need to be informed and willing to do a little extra work to keep macaws as pets. Buying directly from macaw breeders is, unlike buying from breeders of other pets, a great way to find the best deal possible. 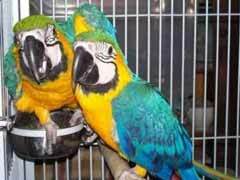 Many of your local and chain pet stores with macaws for sale will purchase their birds from local breeders. Although pet stores usually buy lower cost breeds; it is not uncommon to find scarlet macaws for sale at these stores. Transporting birds can be expensive and stressful for the bird, so local breeders are the best source for these stores. Because you are buying from a breeder you will be getting the same product without paying the middle man. Looking for scarlet macaws for sale will tend to be much easier than looking for the rarer, more expensive, breeds. These breeds, such as the miligold macaw, should be purchased after they have been weaned. This way your new pet will have their distinctive colors since baby birds all look the same. Otherwise you can end up paying double for the same product, and because you are buying from a breeder you may not have any recourse. When buying a breed like the yellow collared macaw, this rule applies even greater because of higher than usual cost. If you are looking for macaws for sale and you have experience with baby birds, buying baby macaws and hand feeding them yourself can save you a ton of money. Again, unless you are sure of the breed, don’t buy high end breeds this way. Hand feeding your pet will also help develop a strong bond between you and the macaw, another plus to buying macaws for sale from breeders. Buying macaws should be treated like buying a new car, be sure to cut out the middle man, be sure you have a reputable dealer, and be sure to educate yourself and you will get the best deal.